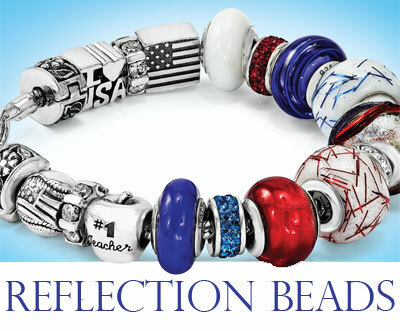 Reflection Beads was created to give women the opportunity to express themselves with their jewelry. We encourage women to create fashionable jewelry designs that have a special meaning... jewelry that tells their story! Reflection Beads features a jewelry system compatible with other leading brands of bead jewelry. Our vast selection currently contains over 2000 high quality beads and charms at very competitive prices. Our extensive array of high quality sterling silver bali beads, hand-blown glass, Swarovski® crystal and Italian Murano glass beads make the ideal gift for any occasion. For unique and personalized birthday gifts, choose from our wide selection of sterling silver letter, number or birthstone beads. Our “From the Earth” category features a stunning selection of stone beads with many colors of coral, quartz, agate, magnasite and serpentine from which to choose. Reflection Beads carries everything you need in order to create your own bead jewelry. We Feature starter bracelets, necklaces, earrings and watches as well as connector beads, grippers, hinged clip beads, stoppers, spacers, dangle beads and security chains. For the largest selection of diverse styles and the latest fashions, always look for Reflection Beads. Choose your beads right here and make a custom braclet, call us for details! We are Ocala's jewelry repair experts! phone:(352) 401-0001 fax:(352) 401-0004 Se habla español.